What happens when you join a miniature club for the first time? I make a “roombox” for the first time! Obviously, or maybe not so obvious. Miniature Club of BC does a yearly club challenge/project which coordinates with the Show (West Coast Dollhouse Show & Sale). The challenges get displayed at the Show. The year I joined, 2009, the challenge was a hutch. Use it in any way you want. And so I did. I had no idea what the boundaries were. I wanted to do a hutch to display quilting materials. Then I wanted to display some quilts and then I wanted to display how they are made. So my first room was created. You can see here that I gave it electricity. The fan on the ceiling as well as a little desktop lamp I made are both working. There are many items in this roombox which I made. The roombox itself was a wooden box from Michaels with handles on either side, which gave me the openings for the windows. 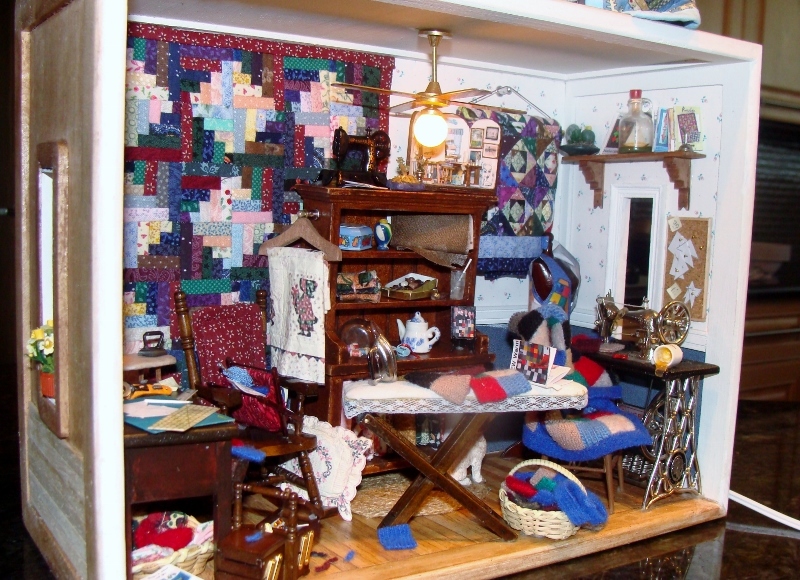 The room is messy and meant to be a quilt room for the busy quilter. There are many details including a cup of tea which has spilled on the sewing machine. 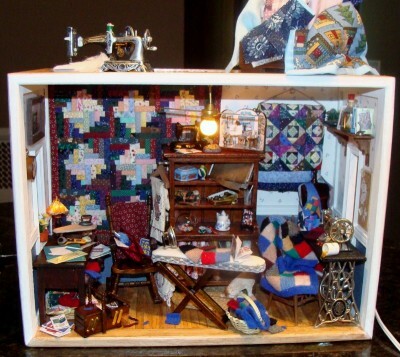 The quilt shown here is a miniature version of a “quilt” project I set in motion for the homeless. 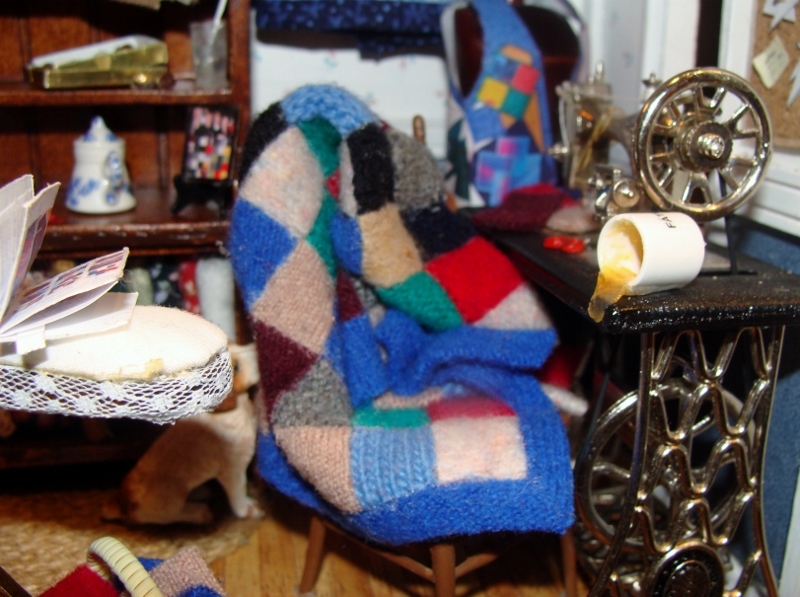 The project was called “Sew Warm” and together with a few members of the Soroptimist group I belonged to for 15 years, we made numerous blankets for donation to the “Lookout Community Shelter” of North Vancouver, BC. This project was made by felting 100% wool sweaters and sewing them together. 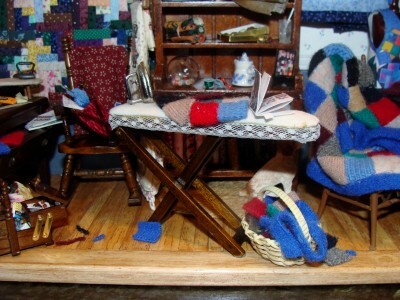 There is a book on the ironing table which is a miniature version of the instruction s I created for project. On the shelf (hutch) behind the open book is a photo of the blankets being presented. So you see, I couldn’t just stop at the hutch. I had a lot to say, and this was such a great way to do it and I will have it forever. Oh! By the way – this won 3rd prize at the show that year! Even better!